Hoya Moose Warm Polarizer filters, are a combination of a polarizer and an 81A warming filter. Collaboration between respected wildlife photographer and conservationist B. Moose Peterson of Wildlife Research Photography and THK Photo Products, Inc., has created a circular polarizing filter that uses 81A optical glass made by Hoya, the worlds largest optical glass manufacturer, instead of the clear optical glass of a normal circular polarizer. When using a camera with a split beam metering system (a metering system that employs a polarized half mirror) which is most of todays auto focus camera bodies, traditional linear polarizers will cause exposure errors do to their light absorption properties. Circular polarizers yield the same optical effect while not causing exposure problems with modern metering systems. For many years, polarizers have been used to remove reflections from non-metallic surfaces such as water and glass as well as being used to darken blue skies to increase contrast in scenic photography. 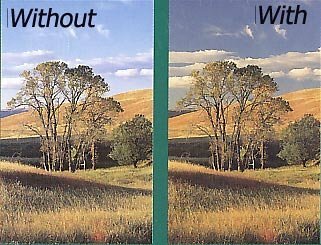 A side effect of both linear and circular polarizes is they "cool down" or make the over-all color balance of a scene slightly bluish. The addition of the 81A glass corrects the color temperature, bringing the scene back to the original 5500K for daylight films colour balance. The 81A glass creates a much more pleasing and "warm" color balance to the entire scene while the circular polarizer increases color contrast and reduces the effect of atmospheric haze. We would always recommend cleaning a filter with a micro cloth to remove dust and general fingerprints. Should something on the filter require a more indepth cleaning use our high-quality disposable lens tissues by Peca and the MC liquid lens cleaner. Make sure the glass surface has to dust or grit on it. Take a lens tussue, fold it one or twice (depending on size) and place a couple of drops of liquid lens cleaner on the tissue and wipe the tissue in a circular pattern starting from the center and moving out to the edge. Immediately follow the first tissue with a new dry tissue using the same pattern. Warning: We do not recommend using a micro cloth with any liguid cleaner because dust and grit an become trapped in the fibers and damage the lens or filter on subsequent uses.